Light: Doing your best. Bringing enthusiasm and zeal to your work. Making an effort to be the best you can be. Finding the work that is right for you. Taking care of the small details. Becoming a finely skilled craftsperson. Building something with your hands. Making a handmade gift. Shadow: Working yourself to death. Doing a half-hearted or sloppy job. Continuing in a job you hate. Buying thoughtless gifts. Producing work with shoddy craftsmanship. Rushing through your work. Rejecting opportunities to learn more about your craft. Story: The Main Character is shown to be the very best at his or her chosen vocation. Relationships. Discover what your partner loves or needs and make a special effort to deliver those gifts, words, or service on a regular basis. Consider the value of a handmade gift. Partners should look for ways to demonstrate their dedication to each other. Busy? Make sure a request from your partner or friend rises to the top of your “To Do” list. Work. All too often, compressed schedules demand we do “just enough.” Today, try going beyond the bare minimum. Add that extra touch. Devote a little personal time to completing your work. Even if the task is an ordinary one, strive to make today’s product extraordinary. Others may not notice the difference—but you will. Spirituality. Rituals can feel silly, and formal prayer can feel stiff and unnatural. Today, though, invest a little extra time and energy into your spiritual observations. Choose something to wear that reflects your faith. Acquire a special item for a home altar. Be in the moment, devoting extra attention to the small details of your faith. Personal Growth. Instead of just getting by, a mature person recognizes that every project and every interaction is a reflection of character. What would recent projects say about you? With an eye toward improving your image and reputation, how might your work and speech need to change? Fortune Telling. Stop over-analyzing, researching, and outlining. Buckle down and get the work done. When? Between August 23rd and September 1st. The Devoted Craftsman. 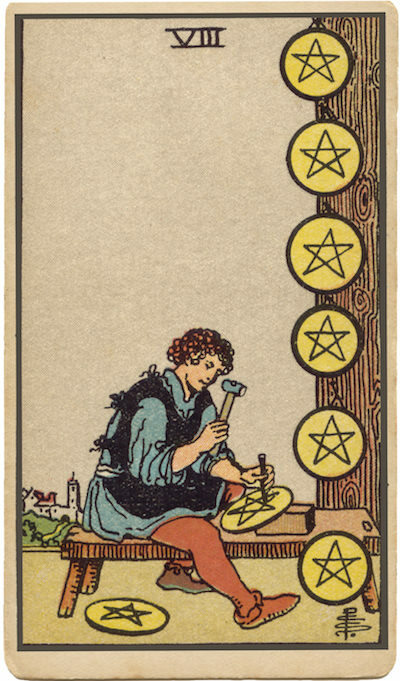 RWS-inspired versions of this card often show an isolated worker carving a number of shiny new pentacles. Note how he loses himself in his work! What might happen if you shunned distraction, isolated yourself, and focused yourself entirely on the work at hand? One Coin at a Time. Our friend on many versions of this card has several coins hanging on the doorpost … but he can only make one coin at a time. What small step can you take right now toward realizing a larger plan? Getting Lost in the Work. In the rush to complete a project, we can easily lose our connection with the simple pleasure of work done well. How can you start taking pleasure in the process? The Marseilles Image. Eight Coins have been arranged in two precisely balanced rows of four. The arrangement looks deliberate; someone worked hard to move each Coin into perfect alignment. When your work is done, what evidence will there be of your own dedication to perfection? How can you improve your level of dedication and focus? What work do you do best? What about that work appeals to you?